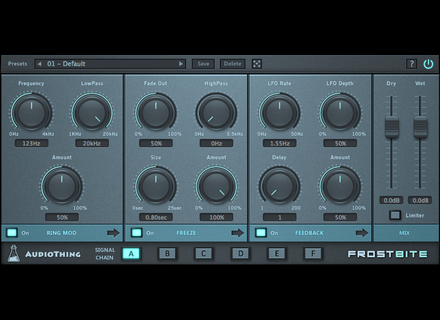 Frostbite, Other effects bundle or multi-effect from AudioThing. AudioThing introduces a new plug-in for Mac OS X and Windows with three effects designed for tweaking ambience, sound design and cinematic projects. The VST, AU and AAX 32 and 64-bit plug-in for Mac OS X and Window also includes a preset system with a randomizer. Frostbite is available for the introductory price of 29 € instead of 36 € at www.audiothing.net. Wusik Station updated to v8 Wusik is working on both Wusik 8000 and the 8th version of its Wusik Station modular synth. An Alpha version has been released for the latter.